It was a busy week in Astana and took some time to process all of the materials. In addition to my excursion to Rodina, I conducted interviews with officials on the sidelines of the Astana Economic Forum, attended the IMF Press Conference with Prime Minister Karim Massimov and IMF Managing Director Christine Lagarde, and observed the Presidential Commission on Land Reform. It was a busy and fascinating week, and I will attempt to present the complexity of land reform in a multi-part blog series. This first post provides an overview of the patterns of ownership of Kazakhstan’s agricultural lands and a discussion on the current status and economic productivity of the country’s agricultural sector. My second post will discuss the political history of land reforms in Kazakhstan, including the various arguments presented by different factions in recent months. The third post will discuss the politics of land reform, including an overview of the President’s Commission on Land Reform. Before we analyze the politics of agricultural land reform – the subject of the most recent wave of political unrest in Kazakhstan that forced by Minister of Economy Yerbolat Dossayev and Minister of Agriculture Asylzhan Mamytbekov to resign – let us first gain a more comprehensive understanding of agriculture in Kazakhstan. I hope to prove that land reform is just one small component in the broader challenge of agricultural reform in Kazakhstan. Kazakhstan is largely an agrarian country, with 43% of the country’s workforce in rural regions, where agriculture is the primary employer. It is no surprise land reform is so controversial given this demographic reality. As demonstrated in the Figure, “Employment Dynamics in Kazakhstan (2004-2016)”, while the agricultural workforce has remained relatively stable since 2004, the country’s urban population has increasing steadily since 2012. This is largely due to internal migration, as agriculture remains a low-valued sector that offers low wages and few opportunities for upward mobility. These structural-economic factors, in conjunction with the relatively rapid development of the cities of Almaty and Astana, have resulted in a wave of internal migration in recent years. According to the Agency of Statistics, there was a positive net migration to Astana through 2014, though in 2015, for the first time since 2004, the city experienced a net migration outflow of 2,488 workers (compared to an inflow of 17,880 workers in 2014). Meanwhile, between 2004 and 2015, South Kazakhstan Oblast, Zhambyl Oblast and Karaganda oblasts experienced a net outflow of workers. This change in population dynamics, as mentioned by officials on the Presidential Commission on Land reform, is one of the reasons why Kazakhstan’s agricultural sector lags relative to other major agricultural producers. According to the Agency of Statistics, Kazakhstan’s total population in 2014 totaled 17.16 million, of which 7.7 million (45%) were rural inhabitants, while 9.43 (55%) lived in cities. This trend continued in 2015 with 43% of the population in rural regions, and 57% in urban areas. Preliminary data for 2016 suggests that the 43% - 57% division holds constant. Because agriculture is considered a low-value vocation, there is little emphasis on training and the development of expertise. Last week, I had the pleasure of having tea with Kenzhegali Sagadiyev, a two-time deputy in the Mazhilis (3rd and 4th sessions), current President of IT University in Almaty, former President of the National Academy of Sciences of Kazakhstan (Almaty, 1994-1996) and rector of the Kazakhstan agricultural academy (Astana, 1996-2000). Sagadiyev shared a conversation he had with an Israeli official, where Sagadiyev asked what explains Israel’s phenomenal performance in the area of agricultural production, since the country has limited natural rainfall and is mostly covered by desert. The Israeli official responded, “every farmer is a scientist and a student (ucheinyi).” This is precisely the sentiment that should be applied to the agrarian workforce in Kazakhstan – only through a more efficient use of labor and technology can Kazakhstan’s agricultural sector thrive. 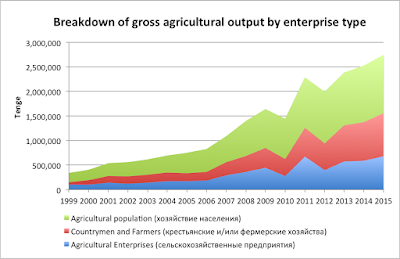 As evident in the chart, while output across all types of agricultural organizations has increased since 1999, production has generally increased since 2006, albeit with slight periods of reduced output in 2010 and 2012. By 2015, the agricultural (rural) population generated 43.25% of gross output, while countrymen and farmers made 32.11% and large farming enterprises 24.64%. This means that large industrial farms, like Ivan Sauer’s Rodina’s farm, only constitute one quarter of Kazakhstan’s total agricultural output. 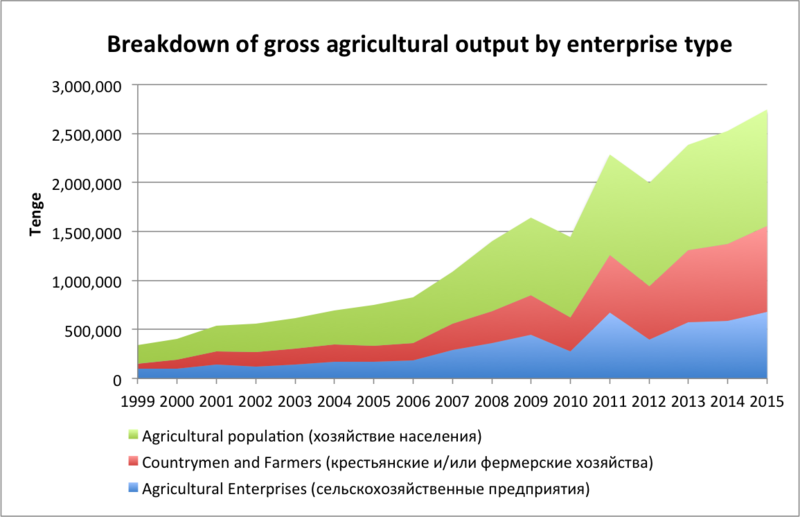 Small farmers and plots are responsible for the remaining two-quarters of agricultural output, when measured in tenge terms. According to the Agency of Statistics, as of May 2016, of the 1.3 million small and medium enterprises (SMEs) registered in Kazakhstan, 14% were small legal entities, 0.2% were medium-sized legal entities, 72% were Individual Enterprises (IPs – many traders in Baraholka are registered as IPs, and this is a very easy, simplified form of business registration that any consultant, accountant or contractor could fill out to register their activity with the tax authorities), and 14% are small farms (крестьян). According to Kairat Bissetayev, chairman of the Union of Potato and Vegetable Growers in Kazakhstan, that represents over 300 farmers throughout the country, the soil quality and low rainfall in these northern regions lend themselves to larger, industrial-like farms that focus on the cultivation of potatoes, wheat, and barley. In contrast, southern regions contain greater numbers of small, family-owned farms that grow fruits and vegetables. 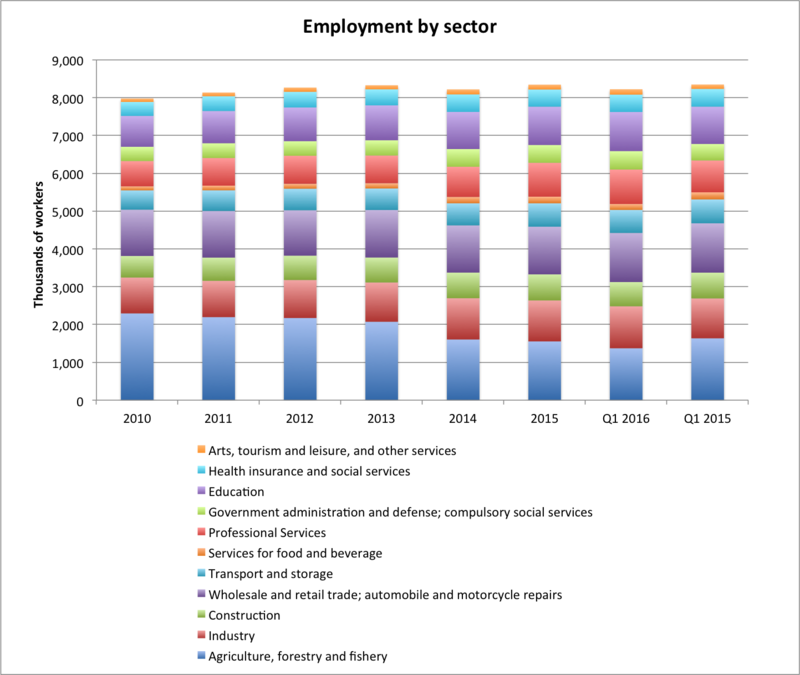 In terms of employment by sector, in Q1 2016, 16% of the workforce was employed in the agricultural sector, compared to 19% in Q1 2015. 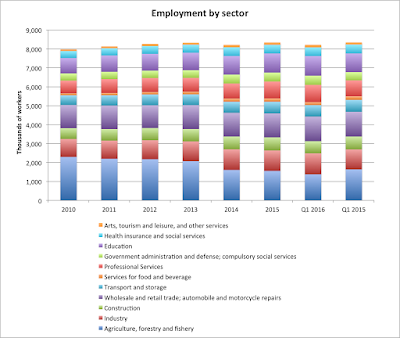 The number of workers in agriculture has actually declined since 2010, when the sector employed 2.29 million individuals (28% of the employed workforce), compared to 2.19 million (26%) in 2011, and 1.55 million (18%) in 2015. The decline is likely caused by internal migration within Kazakhstan, as the majority of economic opportunities are concentrated in major cities. Though, it is important to note that agriculture is one of the most informalized sectors in Kazakhstan, which means that statistics do not likely capture the full scope of employment. In short, across a variety of indicators, agriculture is an important component of Kazakhstan’s economy. However, agricultural production accounts for less than 20% of GDP and is a dismal source of budget revenue; over 50% of Kazakhstan’s budget comes from oil-related revenues. Thus, any (attempted) modification to the 2003 land code will inevitably run into obstacles, given the predominance of agriculture as a source of livelihood for thousands of Kazakhs. The extension of the time period a foreigner can lease land in Kazakhstan from 10 years (currently) to 25 years. The bill stipulates that individuals who are married to foreigners (someone who is not a citizen of Kazakhstan) are prohibited from purchasing land, as this could be a mechanism of transferring property rights. The bill preserved the existing law that allows a joint venture wherein a foreign company owns 49% (less than 51%) to purchase land. But there are also stipulations that effectively grant the Kazakhstani partner the ability title over the land in the event of a sale, or issue. The legislation does not grant foreigners the right to purchase land. In fact, based on my interviews and the exchanges at the Presidential Commission, there is almost a near consensus that Kazakhstan will not allow foreigners to purchase land. The main questions are: should foreigners be permitted to lease land, and if so, on what terms and for what period of time? Currently, the majority of agricultural land in Kazakhstan is leased. According to data from Jerturaly.kz, the government website established to inform the public on land reform, of the 100 meters of agricultural land, 99.5 million hectares (98.7%) are rented, and 1.3 million hectares (1.3%) are privately owned. Leasing agreements enable farmers, especially those with little experience who are just starting out, the opportunity to experiment without taking on the long-term commitment of a land purchase. Plus, leasing the land is more often than not the most financially feasible option. Recognizing the importance of agriculture to employment, and the fact that most agricultural land in Kazakhstan is leased, any future amendments to the land code must be made conscious of these realities, and done in a way that would make Kazakhstani agriculture an attractive and safe destination for foreign direct investment. In an interview, Bissetayev observed that the proposed amendments to the land code will not have a major impact on the future development of Kazakhstan’s agricultural sector. Rather, Bissetayev emphasized the need for investments in agricultural production technologies that will enable farmers to add value-added to their products. For example, potato growers in Kazakhstan do not manufacture French fries or other secondary products, and this is one clear area where Kazakhstan could compete, particularly in the Commonwealth of Independent States. The largest supplier of French fries to fast food chains in Europe and the region, according to Bissetayev, is Netherlands-based Farm Fritters, using potatoes from Poland. American companies are also active worldwide (surprise!). While potential foreign investors in Kazakhstan seek investment guarantees, such assurances are related to financing and legal shareholder structure, rather than land ownership. Plus, Kazakhstan’s agricultural community does not necessarily seek expertise in the simple cultivation of crops – Kazakhstan needs technology and production. Moreover, Bissetayev emphasized that natural, environmental conditions make agriculture in Kazakhstan a very high-risk sector. Kazakhstan has very low precipitation levels and a relatively short growing season. Between May and August, the average annual precipitation is 10 mm in Northern Kazakhstan, and 250 mm in Southern Kazakhstan. In comparison, in Southern Russia the average precipitation is 350-400 mm, in Belarus 600 mm, and in regions in South America, this could reach, or exceed, 700 mm. Meanwhile, Belarus receives 600 mm. Consequently, Kazakhstan suffers from a poorer soil quality, on average. The high-risk nature of Kazakhstan’s agriculture exacerbates the challenges associated with securing credit. In Kazakhstan, Bissetayev asserted that most credit is issued with a payback period over 50-70 years, when it should be closer to 70-90 years. Under the old exchange rate (prior to the August 2015 devaluation), farmers could secure credit at an interest rate of 4-6%. Recently, however, rates have hovered in the range of 9-12%, and sometimes 15%. Ultimately, agricultural land reform is important given the centrality of agriculture in Kazakhstan’s economy, but it is a relatively minor question in the broader context of reforms and modernization. Do you need a loan to pay bills/finance your business? Do you need a loan to finance an existing business or start up one?